Look, all I'm saying is that some people are crazy, ok? 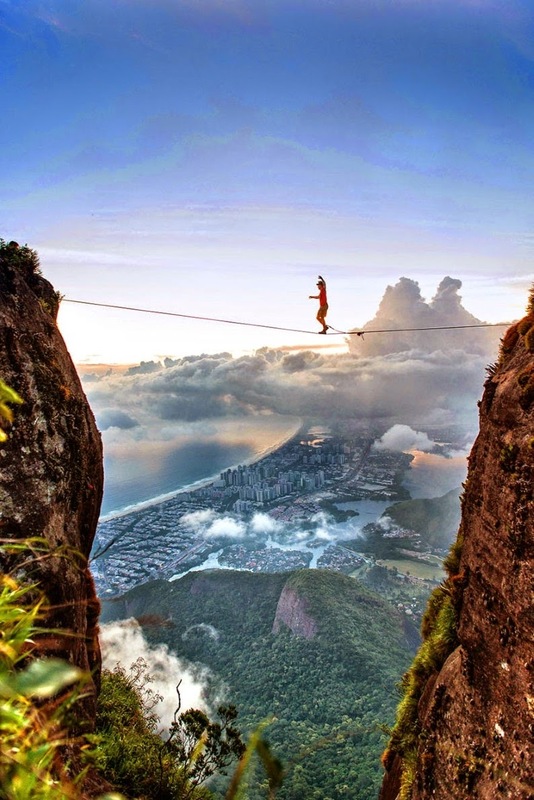 And, yes, that guy on the tightrope is one of them. Yes, he's tethered to the line, but still... nutso. Obviously done for the photo-op, and to impress onlookers... I can't imagine that dude could take even a split second to enjoy the view from up/out there... hyper-focus time, eh? Would I ever have the balls to try such a thing? Absolutely not. I can barely even post it up here without feeling a trifle queasy! Other than that, I'm all man, baybay! Woohoo! Well, what *can* I do, you may ask? I went to that Joe Abercrombie book signing I was threatening to regale you with! Let the regalation begin! Believe it or not, I have almost no photos to show you. I intended to document the entire event, beginning with a photo of the store front before the legions of Abercrombie fans descended upon the place... but I was inside the store before I knew it... here, let me ruthlessly rip a photo off Google Images and shameless pass it off as my own! There, that's what the storefront looked like! Pretend I took that, ok? In fact, that shot was take July 12, so the posters in the windows are exactly the same as when I was there, eh! The magic is complete! I arrived an hour early, to be assured I got a decent seat before the Abercrombie Nation arrived. There was a little corner set up with a podium and about 20 chairs... I thought, "lol, no way... that's WAAYYY too few chairs..." so I grabbed one quick, in the back row. Of course, most of the seats were empty still, but there was still an hour to go. The only other people there were about a half-dozen older people... and when I say older, I mean the youngest might have been mid-sixties. I thought perhaps I was in the wrong place, but no, up by the podium was a huge display of Joe's latest book "Half a King". So I sat and listened to the older folks chat. Turns out, their hobby is going to Fantasy/Sci-Fi signings and getting lots of books autographed, so they can sell them online. They travel city to city, event to event, throwing out names of authors and books, like a bunch of kids with baseball cards. It was surreal. 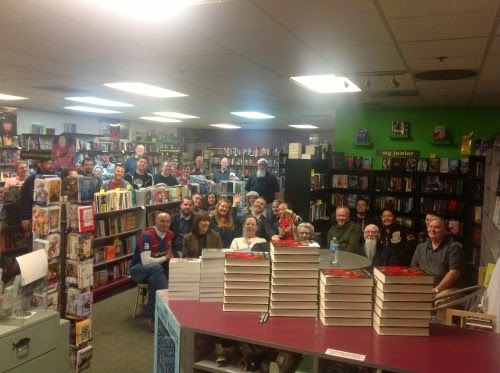 You really need to experience sitting behind people nearing eighty as they discuss their plans to attend "Bubonicon" next month in Arizona (or wherever)... they were talking like old pros... listing off the books they'd had signed, how long they'd waited in line for certain authors, etc. More old folks trickled in. They all greeted one another like old friends. Each carried at least a half-dozen different Abercrombie titles to get signed. It just felt.... wrong... like a business instead of a passion. Thankfully, a few younger loners (like me) also gathered, taking seats. I breathed a small sigh of relief. About 5 minutes before the start time, Joe himself arrived, all smiles. By then all but 2 of the chairs had filled up, and another dozen folks were standing. Yes, the crowd leveled out at about 40 people. Total. The Abercrombie Nation had appeared, and it was shockingly meager. But if it bothered Joe, he never let on. He was all smiles and jokes. That's from a different signing... same store. Man, I think I recognize some of the same old autograph hounds though! Lol!... picture me in the back there. That's actually about the size of the crowd, including the standers. When I handed him my book, thanking him for coming, I told him how cool it was that I was now in possession of my three favorite books, all signed by their authors. So he said, "Really? What are the other two books?" A simple question, yes? Well, hey, let's see you answer a simple question when you're laboring under the nerves associated with meeting someone you admire! I looked at him for a few excruciatingly long moments while I tried to get my head to work... I finally said, "Well, Gates of... uh.. Fire..." and Joe said, "Ah, Pressfield! Good company! And the other?" lol.... I said. "Ummm..... "
"I'm drawing a blank... oh! Rothfuss! Name of the Wind! That's it." I went to Starbucks and drove home. Is It Sleepy In Here, or Is It Just Me?